We are excited to continue highlighting Latin@ owned wineries this week. Enjoy our latest interview with Raquel. Varietals: Syrah, Zinfandel, Cabernet, Rhone Varietals, Pinot Noir, amongst others. Where is your family from? When, why, and how did they come to the USA? My paternal family is from Tepatitlan, Jalisco. They all now live in Guadalajara and are panaderos (bread makers). They still own the original family panaderia in Guadalajara in addition to one more bakery owned by my half-brothers. My maternal Abuelito was originally from Irapueto, Guanajuato. He left Mexico in 1916. My maternal Abuelita was from Chihuahua, Chihuahua. She left Mexico in 1910. My Abuelita's family went to Abilene,Texas first where my grandmother learned to speak, read and write English. After Texas she moved onto Denver, Colorado and then followed by Nebraska and Kansas. Undoubtedly, as she followed the crops in search of work the living conditions posed an additional challenge taking her to live in boxcars with animals. Like many Mexicanos who left their homeland in search of a better life for themselves and their children, my Abuelitos also left Mexico for a better future and eventually met in The United States, I’m just not sure where. Eventually they settled in Chicago, Illinois, where my Abuelito worked at Carnegie Steel and my Mamá and siblings were born. With the exception of the last child, my Abuelita carried across Route 66, was born in King City, California after leaving Chicago in 1947. Re-living the Grapes of Wrath, only Mexicano style. Once again we were in search of a better life. They arrived in California and worked in the fields. Traveling wherever the crops were maturing by picking cotton, grapes, chopping weeds, working the short hoe, fruits mainly in the San Joaquin Valley but also traveling to Healdsburg and Napa to pick plums. Was Spanish your first language? I think because my Mamá was born in Chicago, they were all very proficient in English. Although, they also spoke Spanish. I grew up hearing both languages at home (codeswitching). The adults basically spoke Spanish when they did not want the children to understand, but we did. Did you grow up with wine? No, not really, but I made up for it in college! LOL I do recall my family, occasionally having Basque wine with dinner that was made by the sheep herders in the San Joaquin Valley. After meeting Augie, I was introduced to fine wines. He was quite knowledgeable. Augie and I met in Cambria at Camozzi's Saloon, while celebrating my girlfriend's birthday. Whose idea was it to start a winery? Augie and I went about it in a slightly different way. We first bought a small retail wine shop in Harmony, California. We specialized in wines from the Central Coast which allowed us to meet many people in the wine industry through this business. One day we were given the opportunity, by a pioneer in the Rhone world, who would teach Augie how to make wine and sell it from our retail shop, the Central Coast Wine Room. We did this for several years. You love to cook, what is your favorite food and wine pairing with your wine? I enjoy cooking and I especially enjoy cooking the food from my childhood. Dishes like chile colorado, nopales y tortas de camarron, albondigas, caldo de pollo from our farm-raised chickens, picadillo, and chiles relleños which I usually pair with beer. My favorite season is the fall and winter where I love cooking stews, lamb shanks, short ribs and pair which I pair with our Syrahs. Your winery seems to focus on Rhones and Zins, what is a wine you enjoy that you do not make? I enjoy Pinot Grigios and Sauvignon Blancs in summer. Although, we did make a Sauvignon Blanc a while back. What are some of your hobbies outside of wine? I am a quilter and enjoy quiet time writing, collecting music, scrapbooking, and mixed media art. And most currently I am starting jewelry making. I enjoy the different wine regions throughout Europe such as Priorot, Gratallop, Rhone Valley, Burgundy, Provence and Piedmont. Where did you witness your most beautiful sunset? This one is tough for me. I see beautiful sunsets every day. What wine of yours would pair perfectly with that sunset? 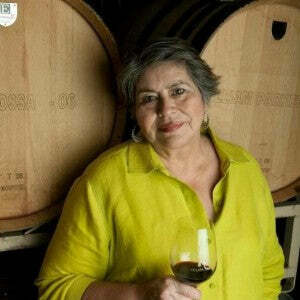 I would pair a Rancho Ontiveros Pinot Noir. An Invitation to Fathia Vineyards Harvest Celebration - October 22nd!